My Weekly Indicators column is up at XE.com. The bifurcated economy of last year is undergoing some important shifts. 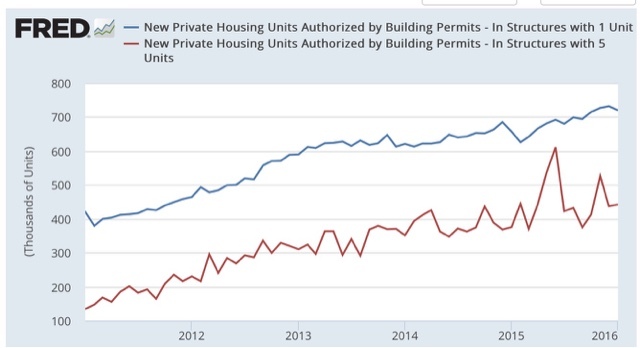 Yesterday I noted that the housing market lately has been subject to a lot of conflicting crosscurrents, and noted that excluding NY, which skewed the national reports higher by 100,000 units in May and June, the trend in housing permits has continued higher. 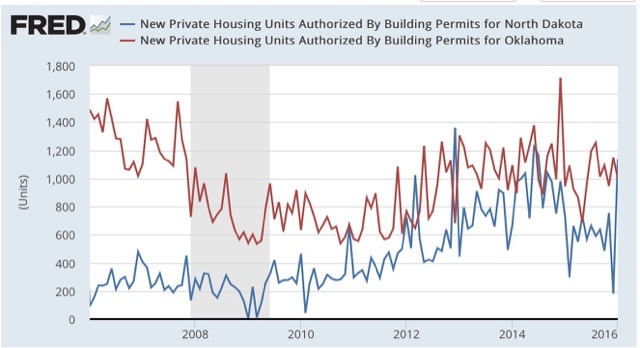 In the past, single family permits have usually declined before multi-unit permits, as buyers turn from their first to second choice in housing as conditions deteriorate. 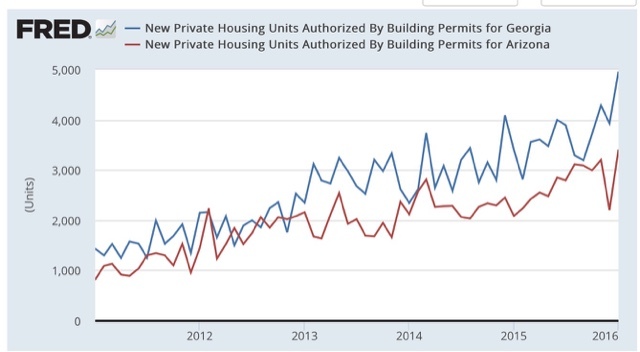 This is hardly an exhaustive list, but it certainly does suggest that the depression in the Oil patch has coincided with a decline in new housing activity, while outside of the Oil patch, permits have continued to rise. Yet another crosscurrent is the increase in foreign buying of higher end properties. Foreigners typically pay cash, In the last several years the Canadian, British, French and German buyers have been surpassed by the Chinese. According to the NAR's Profile of International Home Buying Activity, through March 2015.
International unit sales totaled 44,000 properties, 12 percent of Florida’s residential market (15 percent a year ago), compared to four percent nationally. So part of the relative softness in new housing activity in the second half of 2015 probably reflected less foreign buying of US properties. The recent decline in mortgage rates is only going to help home purchasers and should help drive improvement in the housing market going forward. 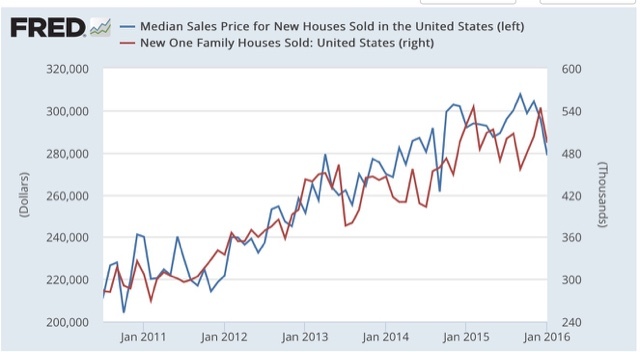 To summarize, the housing market is a real muddle. I think the least bad interpretation is that it has been going sideways. 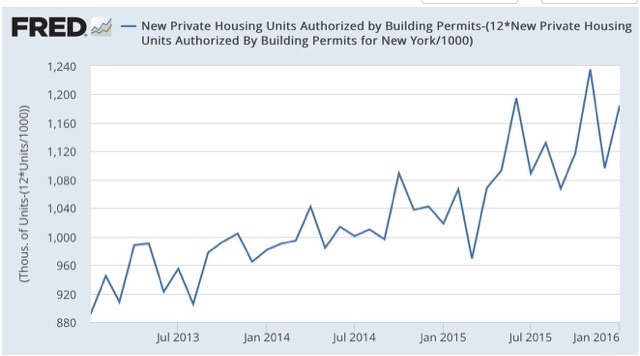 Although the NYC-induced distortions may have translated into the real economy via starts, I am very reluctant to consider that spike a turning point, when single family permits and permits ex-NY still show an uptrend. 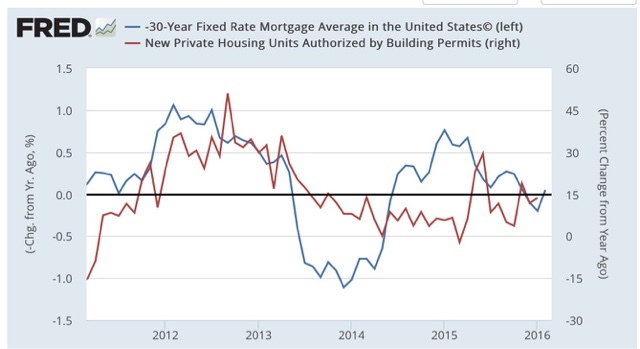 Finally, recent low mortgage interest rates should translate into more home-buying and an increase in permits and starts a few months down the road. I've been withholding comment on the housing market while waiting for the state-by-state breakdown, which was finally released this morning. 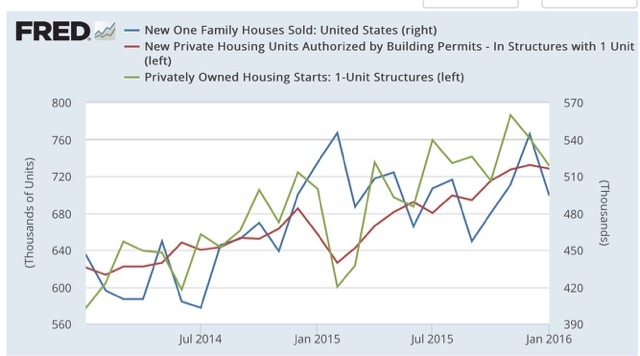 The truth is, there are so many crosscurrents in the housing story that it is tough to discern any one trend, so I'll divide this analysis into two posts. The huge spike caused by the expiration of a NYC program last June is still affecting the YoY and monthly trend. But if those permits translated into actual starts, then maybe they shouldn't be treated as distortions after all. Then there is the similar effect of the remarkably warm December in the Northeastern US. And what about the collapse of the fracking industry in some states of the Oil patch? Further, the price aspect of the market in particular has also been affected by the big increase - and now decrease - in foreign cash buyers of high end properties over the past few years. In other words, I can generate graphs that point up, sideways, and down, all of which have credibility. A total muddle. So let me start by looking at the overall picture, and the specific continuing issue of the NYC spike from late last spring. 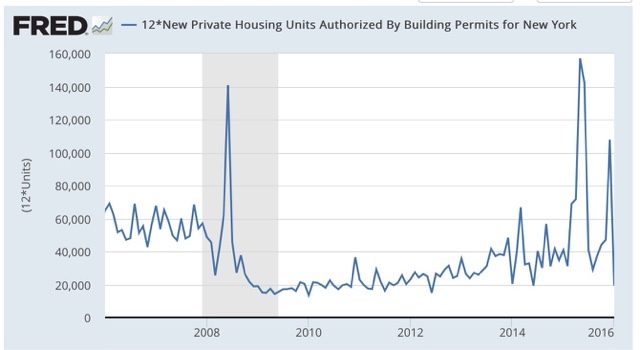 New home sales tend to peak first, somewhere in mid-cycle, followed by permits, and then starts one or two months later - but starts are much more volatile. All of these made highs earlier last year, and turned down in the most recent month compared with December. But all have had secondary peaks recently nearly equaling the early 2015 peaks. 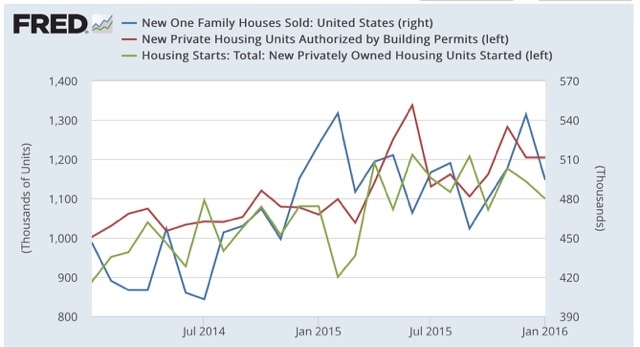 Although January was down from December, single family permits and starts, the trend is undeniably upward. Last spring was a huge spike adding 100,000 extra units to the annualized national total! The trend certainly apprears to be positive if mild. 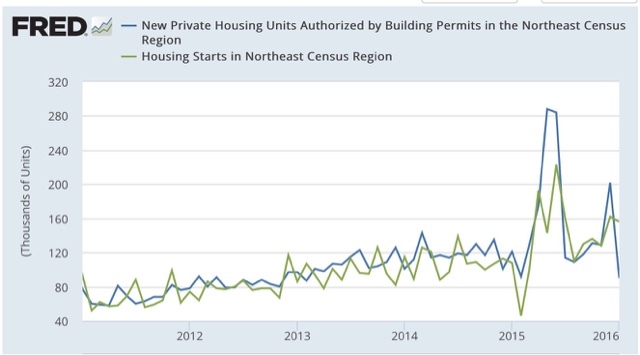 After June the number of starts has exceeded the number of permits in all but one month, so most if not all those permits from springtime appear to have been translated into actual starts in the seven months since. So while the NYC issue may have created a distortion, it is a distortion which has nevertheless translated into the real economy. IN part 2, I will look at other issues in the muddle. 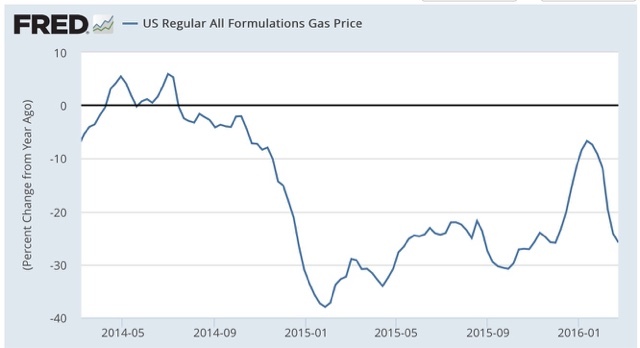 It had looked like the trend was bottoming back in December (when the YoY comparisons were less than 10%), before Oil went below $27/barrel in January and there was a renewed pulse downward. So no forecast there! 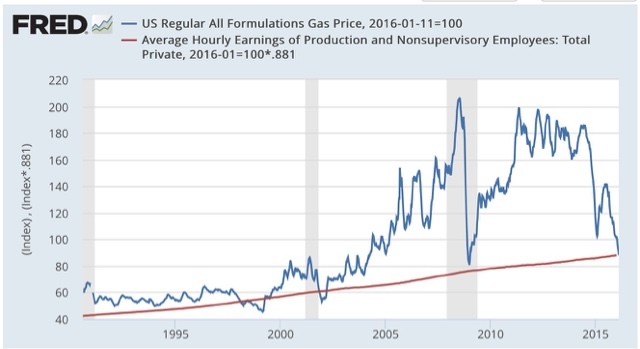 Laborers have to work less time to pay for a gallon of gas than at any time in the last 25 years except for 1998-99 and briefly at the end of 2001 and early 2002. 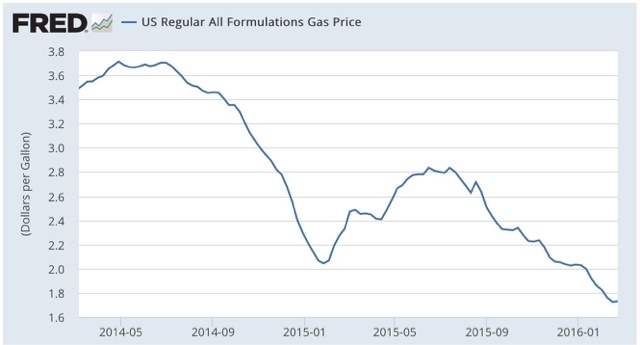 For there to be a new "real" record low would require gas prices to fall to about $1.25 a gallon. 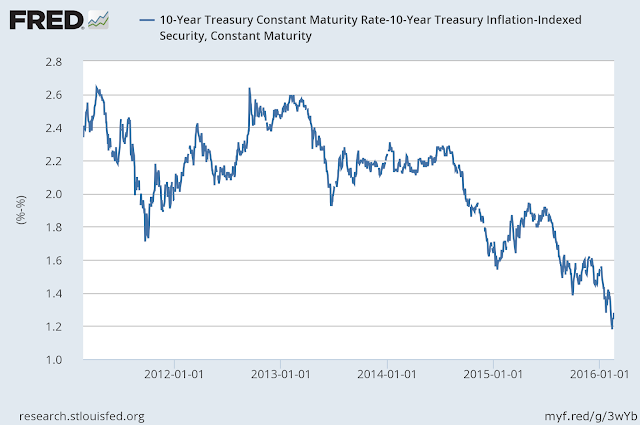 I have a new post up at XE.com, comparing the current situation with the 2001 recession. I'm going to make this as easy as possible for the simply minds to understand. 1.) The US infrastructure is in terrible shape. 2.) The US 10-year bond is STILL really cheap. So, the cost of the project, at current rates, would be a little over 1.2%. And, just to give us a margin of latitude, let's use the 10 year CMT-10 year inflation adjusted difference for the duration of the latest expansion. Eyeballing the chart, we get a ~2.2%. That means that, over the life of the project, we need to make more than 2.2% on an annual basis. That is, literally, the lowest financial bar to jump on planet earth. [UPDATE]: As I mentioned below, I wrote this in a fit of early morning pique. There would, of course, be additional costs. But as most of those would be amortized over an extended period of time (as in 30-40 years minimum), the long-term economic rewards are still far higher than the cost. 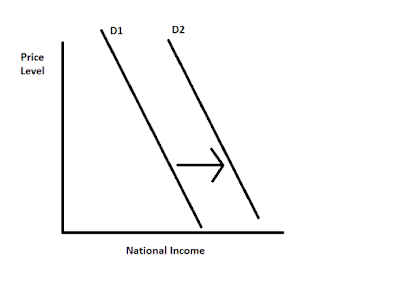 D1 and D2 are GDP (C+I+G+NX). G=government spending. 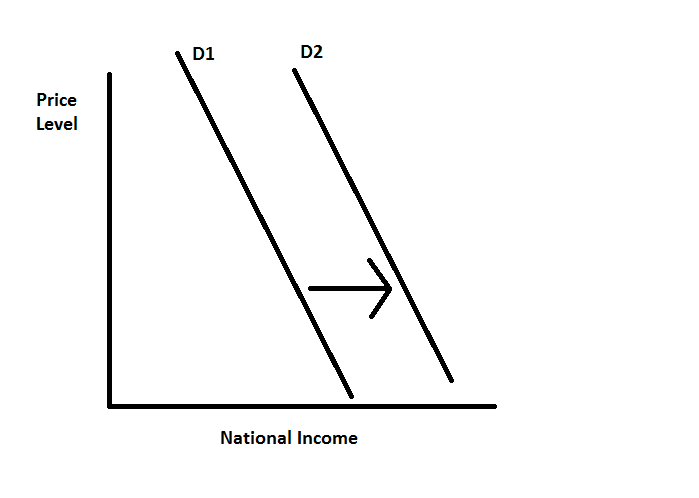 The vertical axis is the price level and the horizontal access is total national income. Borrowing money and spending it shifts the AD from D1-D2. So: we borrow money to increase government spending on stuff we really, really, really, really, really, really, really, really, really, really, really, need. As in BADLY. We hire a large number of blue collar folks who have seen their income stagnate. We invest in something we desperately need. Actually, I realize that most stupid jackasses won't get this, largely because it involves thinking and a basic knowledge of econ and finance. But our readers will get the idea. 1) A large number of people advocating for this line of thought don't know thing one of economics. They always say they do. But even a cursory analysis of not only their writing but their respective backgrounds indicates they either: didn't attend college, did attend college but don't have an economics background, or never worked in finance. Yet for some reason, they think they can say, "it's all about supply and demand" and it's all OK. 2.) There is no economic model where this does not make sense. By investing in infrastructure you're hiring a lot of people now who then build a number of public goods (roads, bridges, electrical infrastructure and the like) that increase efficiency and productivity over decades of time. Simply look at my hometown of Houston, Texas. Four of the major area of growth (Sugarland, Katy, Cypress and the Woodlands) are all on major highways, without which no meaningful growth would have occurred. But with these highways in place, massive growth is occurring. And it will continue to occur. This is just such a no-brainer that the fact we're not even talking about it, let alone implementing it, just boggles the mind. The death of Antonin Scalia, who was an Associate Supreme Court Justice for 30 years, has put a spotlight on the issue of term limits for Justices. I have seen several analyses comparing the recent past with the mid-20th Century, but a more complete picture emerges when we compare the last 50 or 60 years with the 19th Century. The median age at which Justices retired or died, ending their terms, was 68. Eleven served to age 75 or older, and 6 served into their 80s! The median age at which Justices have retired or died has been 78. 1st - 0 - 15 years. The median age of the 8 current sitting Justices is 67. I was surprised at how many Justices in the 19th Century served 25 years or more, and their longevity. There seems to be something about being a Solomon for a living that keeps the blood flowing, even back then! But in general, the longevity of the Justices has increased by about 10 years, from 68 to 78 at the time of their resignations or death; and their longevity on the bench has similarly increased, from 14 years to nearly 25, and potentially over 30 years if the 3 most senior Justices are still serving in 2 years. In my opinion, a Court dominated by septuagenarians, who probably formed their essential ideologies in their late teens over half a century before, and who have been on the bench 25 years or more constitutes rule by a dead hand, whether they be liberal, conservative, or moderate. A Constitutional amendment setting 18 year terms for the 9 Supreme Court Justices has been proposed, with terms staggered to begin/end in the 1st and 3rd year of each Presidential term. This sounds eminently reasonable to me. After that, if they wish to continue to serve, I see no reason why they couldn't become "Justices Emeritus" assigned to the Federal Court of Appeals for the state in which they reside.